You are here: Home » Prophecies » I saw a most beautiful vision of so many people who are right now feeling downcast! I saw a most beautiful vision of so many people who are right now feeling downcast! And they were standing waiting for something, but their heads were just hanging down looking into the ground. Even their arms were feeling heavy and were hanging on the sides of their body. These people were too weak and weary to even lift up their arms and eyes to praise God! I saw the King of Kings wearing the most regal robes, moving from person to person. And He cupped each face in His hands, and kissed each person on their forehead and on both cheeks. Somehow this kiss, woke something up inside them and they lifted their heads. Suddenly each face was shining with the glory of the Lord! Then I saw as each head lifted up, I saw Him put the most beautiful crown on each person’s head. But no crown looked the same! Each crown was fashioned for each individual! And somehow, this crown carried within it the supernatural tools to bring restoration and breakthrough to each and every circumstance each person was facing. 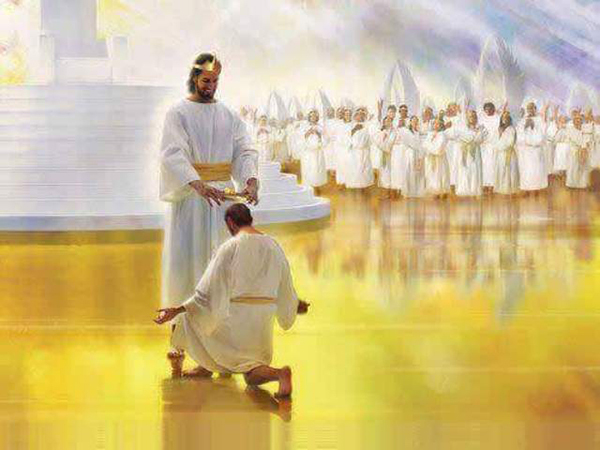 It was like the King gave each person access to the treasures of Heaven! And suddenly, as the crown was put on each head, each person lifted up their head and their arms and worshiped our Lord! But they spoke no words; it was like a deep to deep, spirit to spirit, transaction that was taking place. The King had lifted His scepter of favor, but their heads were so down they never saw it had been lifted all the time! But suddenly they could see with spiritual eyes and hear with spiritual ears things that they thought only others would be able to see! Suddenly, I saw a great rejoicing! Everyone was worshiping and dancing with their new crowns! And as they danced, beautiful robes and mantles fell onto them and each one fit the individual perfectly! Then I looked beyond this vision that was so bright and mostly gold in color and I saw a dark cloudy embankment, and it seemed to want to come over this vision, but suddenly I heard loud trumpets sounding! Many trumpets! But they were not all playing the same note, they were harmonizing! As the trumpets sounded, each person turned towards this dark embankment, and they suddenly stood holding their arms up like they were in worship, but this time, they seemed to be holding their arms and hands in a way when you push something. And suddenly, the most incredible bright beams shone like laser beams into this dark embankment that was threatening to come over this glory celebration. And each beam completely obliterated the darkness! It was awesome to see! And the people then started opening their mouths to declare victory and to declare life and light. All the opposites to what the enemy had been whispering in their ears, and people just continued to worship with total abandon, suddenly realizing just how much supernatural power they actually possessed! They had thought they lost it, but God had come to literally switch it on again! And suddenly these people who were downcast, knew who they were and whose they were, and they knew how to access the treasures of Heaven, which were stored up for them! From this day, things would never be the same! What a beautiful word, and so much like what God would do; and so much like what we would expect Him to do unto us. How rich our hearts of love is for Him. If we could see ourselves on the other side already adorned, is how perhaps He sees us now…..we need to stay clean and enter in to His Presence more often, Amen. Then I put on A long Break Every Chain singing at a church. I was slain in the Spirit for at least 20 minutes and the Lord electrified me and put a crown or something on my head. I wanted to run out of the house and pray for everyone I met. I need to take this seriously and not assume, oh it’s just another encounter with the Lord. We need not cheapen what he us doing by ignoring it… That’s also why writing down the things God tells you or you experience is so important. King’s worship was saying writing them down is how we bring them from the spiritual to the natural world. Damon Thompson said, “We need to go to church for a confirmation, not waiting to hear what they are telling us. We need to be getting the Word from the Lord first. I believe this includes us reading.. everyone else’s words, dreams… We are not going to have this soon. It is going to be us and the Lord only. Yesterday, which was National Day of Prayer, I received Break Every Chain as our prayer theme for my text group. Another member saw the chains over the President and Congress but saw clear Oil dripping over those chains. Wow, thank you Angie for sharing and releasing this incredible vision! Our glorious King to all praise be! His liquid love and glory is about to overtake and be released in us for such a time as this!! This is the ‘more’ we have all been so longingly waiting for! Baie dankie Angie, (many thanks) my sister, God bless. Thank you; this is very encouraging! Thank you Angie and z3news. Has anyone heard bells recently that were not physically there? I’m asking because my wife heard three separate ringing bells this morning in our house and I tried to troubleshoot the potential causes to no avail hence the question to see if this has happened to anyone else.